Theme parks are always searching for ways to remain unique and to stand out from the competition. Outside of the practical benefits of misting, mist and fog can also be used to enhance creative environment. A recent emerging trend in the theme park industry is the creation of entire “worlds,” which extend typical theme park attractions to a completely immersive experience. A park seeks to create experiences centered around one theme, with every attraction, all common areas, retail and dining on theme. Fog and misting can create effects either grounded in reality or mystery that also serve to cool the environment. 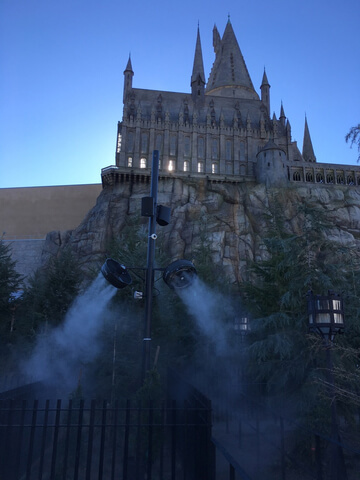 Universal’s new water theme park Volcano BayTM uses mist and fog effects to create a spectacularly realistic experience for guests as they find themselves inside a tropical paradise that draws huge inspiration from South Pacific/New Zealand cultures. Separated into four areas across 25 acres, fog is tastefully implemented throughout rainforest landscapes, caverns, and water rides to add mystery and intrigue while also cooling the surrounding areas. Perhaps the most thrilling addition is a fog blanket thrown across the path of two massive walls path on the muti-person slide, Honu ika Moana.